Laser scanning is a modern technique which has generated much new terminology. Several different expressions may be encountered covering the technique itself. “bombardement laser” : term much used in Switzerland and Belgium, but avoided in English for measurement applications because of at least three very different alternative connotations of “laser bombardment” ! 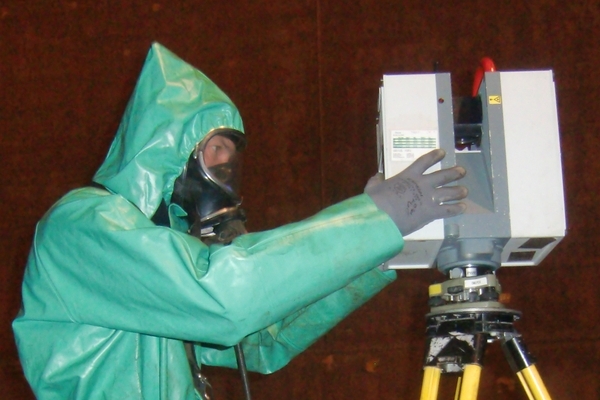 Laser scanner surveys are similar to three-dimensional photographs of the measured object. The position of every scanned point is immediately known in 3D Cartesian coordinates X, Y, Z. From the surveyor’s point of view, there is a radical change of philosophy compared with traditional surveying : we now survey the object in its entirety, rather than merely its characteristic features. The accuracy of such a system can be illustrated by the standard deviation for each observed point. However, the accuracy of the modelled result can be better than the accuracy of the raw data, because of the very high density of the observations and the consequent high degree of redundancy. If you require information at high resolution, opt for this technology! while enabling the acquisition of these coordinates in real time. RGB values obtained by a digital camera. in mobile applications, mounted on a vehicle, or airborne, in conjunction with an on-board navigation system. TPLM-3D is equipped with the Leica Geosystems ScanStation C10. This is in essence a reflectorless distance measuring instrument (using the “time-of-flight” of a laser pulse) with a vertically rotating prism which deflects the laser beam through an angle of up to 270°, mounted on a horizontally rotating base which encodes the full 360° circle rotation. The main innovations of the C10 compared with its predecessors are its operation using an on-board touch-screen interface and its integrated high-resolution digital camera. With a long range of up to 300 m at 90% albedo and 134 m at 18% albedo, the C10 enables the rapid non-contact survey of millions of points. survey of inaccessible detail in complete safety. The resulting point clouds are usable on site, by the client, on the same day (for example to check distances, areas, angles or volumes). measurement accuracy (6 mm at 25 m, 10 mm at 50 m on every point). Our special software enables us to extract surfaces, edges, solid figures, lines and points and then to model the objects in 3D. Alternatively, 2D data (cross sections, elevations, plan views) can also always be extracted. All of these plots and models can then be supplied to you in standard CAD formats.